This essay suggests that Berkeley’s Neoplatonism may be profitably viewed as developed under the influence of Cambridge Platonism. 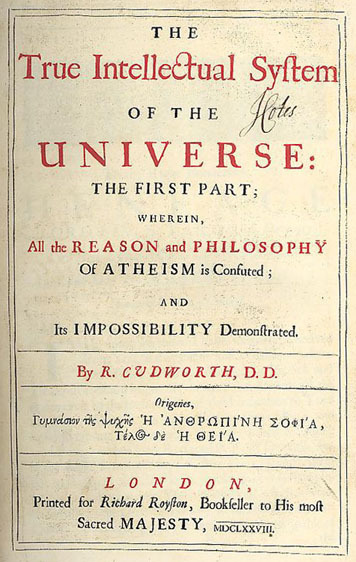 A brief account of some key aspects of Cambridge Platonism are reviewed, specifically the central idea of the Image of God Doctrine (IGD) and Cudworth’s Axiarchism. Then possible points of influence of these aspects on Berkeley’s views are explored. In support of its possible usefulness, this approach to Berkeley’s Neoplatonism is used to shed light on his otherwise puzzling embrace of the pure intellect and abstract ideas. If Berkeley is drawing on the Cambridge Platonism tradition in the way suggested, he can have his pure intellect and its innate ideas without dragging along a commitment to a faculty of abstraction and its abstract ideas. Instead, the pure intellect is seen as a reflective faculty directed to the perfectly particular, concrete self. Susan James, Ancient Wisdom in the age of the new science: Histories of philosophy in England, c. 1640–1700, Dmitri Levitin. Oxford University Press, 2015, xii + 670 ISBN: 9781107513747. In European Journal of Philosophy, 26(1): 676-678.